The safest way to handle a hazardous pumping operation is to use a pump that is designed for the job. 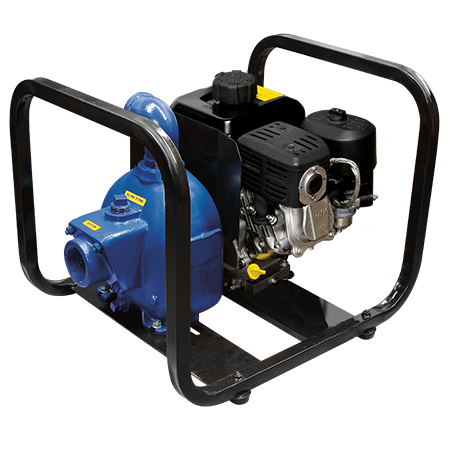 That’s why Shield-A-Spark pumps by Gorman-Rupp feature a spark and splash shielded engine, muffler and fuel cap. Four Shield-A-Spark models are available in 2” and 3” discharge sizes and are capable of delivering up to 395 gpm and heads up to 140'. The gasoline engine unit features a dependable, rugged military or aircraft type spark plug which is radio suppressed and prevents spark gap jumping. A shielded ignition wire provides an enclosed path for high tension spark. The sealed toggle ignition switch is safe and spark free, and the spark-arresting muffler is designed to retard both sparks and flames. Gasoline and diesel models are available that include non-combustible air filters and long-life valves.